It is likely that in the first few months of pregnancy that you might want to throw up. Nausea or also called as “morning sickness” is quite a normal feeling, so don’t get perturbed. With every passing day, your body experiences changes which may cause nausea, which may or may not be accompanied by vomiting. However most times nausea eases out in the second trimester. Avoid spicy and strong flavoured or seasoned foods too as they might sometimes aggravate the feeling of nausea. Finally do try some kind of yoga or meditation as they help in relaxation. The more relaxed you are, the easier it will be for you to cope up with this discomfort. If you are one amongst those women who experience nausea, trying chewing on cardamom or clove – it will make you feel better. You can also try keeping some dry snack in the mouth like Golpapdi a wheat flour based sweet is easier to prepare than any of the other traditional Gujarati sweets. It’s a great way to meet your energy needs when you don’t feel like eating anything. Whole Wheat Methi Khakhras are made of whole wheat, these khakhras are a rich source of complex carbohydrates, protein and fibre. The sesame adds to the calcium quotient of this yummy snack, while methi gives iron to build your haemoglobin stores. Rich in nutrients like protein, iron and vitamin E, Til and Dry Fruit Chikki will beat fatigue and satisfy your sweet tooth in one shot. Nutritious jaggery replaces sugar in this wonderful chikki, while iron-rich til imparts a nice texture and intense aroma to it. Rely on fruit juices and shakes if vomiting persists. Try to consume at least 2 litres of water every day to maintain fluid balance in the body. The flavours and textures of the two fruits also complement each other, making the Pear and Pomegranate Juice a well-balanced one that does not require sugar to make it palatable. Pomegranate gives a very attractive colour to the juice, while pear adds bulk and also gives you potassium, which helps keep blood pressure under check. Black Grape Shake is rich in energy and protein, and the addition of yoghurt not only improves the texture and flavour of this drink, but also adds more protein and calcium. Add nuts to your regular fruit shakes and give it a nutty taste with added nutrients just like our recipe for Fruit and Nut Milkshake where a variety of healthful nuts like almonds, walnuts and pistachios are added which makes it omega-3 fat rich and adds to its protein quotient. 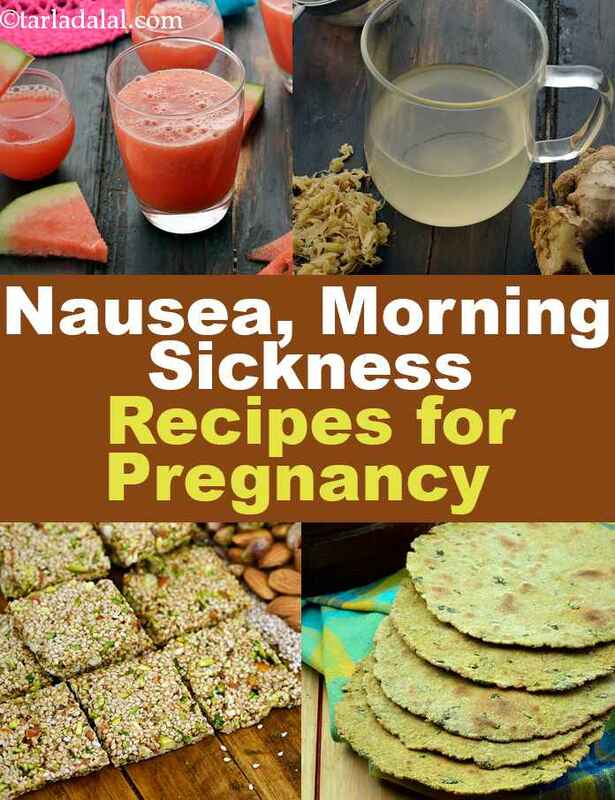 Enjoy all our nausea, morning sickness recipes for pregnancy. Explore more varieties in our pregnancy section everyday.